180 gram audiophile double vinyl. Featuring Liam Gallagher an Paul Weller. First pressing of 2,500 individually numbered copies. 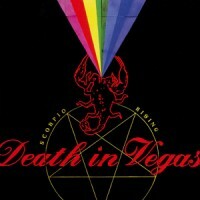 Scorpio Rising is the third album by British electronica band Death in Vegas, which features guest vocalists Liam Gallagher, Hope Sandoval, Nicola Kuperus, and Paul Weller. Death in Vegas’ Richard Fearless and Tim Holmes created one of their finest records by combining synths with guitar rock and psychedelia. A taste of “My Bloody Valentine” and some electro pulses are thrillingly constructed in the different parts of the album. They’re using different samples in their sounds, so you can hear classics like “Rock Around the Clock” (Bill Haley & His Comets) and “Goin’ Back” (The Byrds).